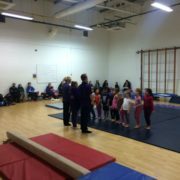 We have reminded gymnasts and parents of these rules and expectations multiple times across this period. And have documented all incidents deemed “unsafe” throughout this time frame. • There will be benches/seating provided outside in the corridor if you wish to wait for your child. • The double doors to each entrance to the hall will remain closed. Please do not block any set of double doors as these are fire escape routes. • The desk will be available for signing in, and positioned outside the front double doors. 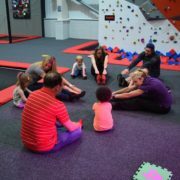 • Any gymnasts within the youngest group of the session will be accompanied to the toilet by a coach if necessary, or parent if they are still on site. • Please can we ask you to kindly help us out by ensuring your child goes to the toilet before each session to help prevent interruption of the 60min session. • During the last 5 minutes of a session, parents are more than welcome into the hall to view the “stars of the session” awards, and collect their child. 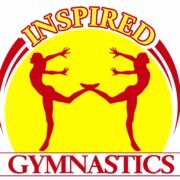 • Events in the future like our Camp Days where we do displays at the end of the day and our Club Competitions, parents are more than welcome, and encouraged to view the display/competitions that gymnasts have been working on. • During spectating, we require silence, and no photography in the interest of safeguarding/H&S. 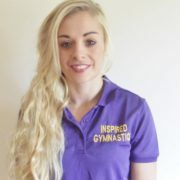 • Anyone photography breaches will be reported to our welfare officer, and so British Gymnastics, and the gymnasts membership will be at risk. • Events like the 2018 Club Comp will feature professional DBS checked photographers, from whom pictures can be acquired. We hope you understand and respect these changes. 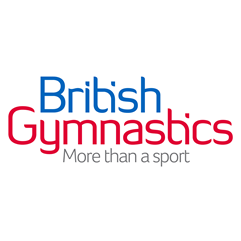 The gymnasts safeguarding and health & safety is of paramount importance to us throughout all our sessions and this is why these changes need to be made. These are not decisions we have taken lightly, and were made through continual reflective coaching and conversations with a number of leading practitioners from a number of departments. 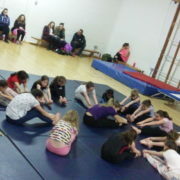 Including professionals working in Safeguarding/Welfare, Primary Education and British Gymnastics. 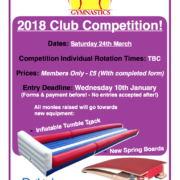 2018 Club Competition! - Entry Open!